The United States Congress designated the Sangre de Cristo Wilderness (map) in 1993 and it now has a total of 219,899 acres. All of this wilderness is located in Colorado and is managed by the Forest Service and the National Park Service. 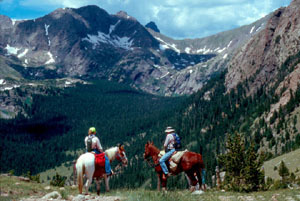 The Sangre de Cristo Wilderness is bordered by the Great Sand Dunes Wilderness to the west. Sangre de Cristo is Spanish for "Blood of Christ," but no one is quite sure why the region was given this name. Was it because of the bloody hues washing the slopes at sunset, or the cry of the dying priest, "sangre de Cristo," as his martyred blood flowed onto the ground near here? Of the long and colorful Spanish influence in these mountains and in the San Luis Valley below there is no doubt. Two four-wheel-drive roads over Medano Pass and Hayden Pass, as well as access to Lily Lake, were slim exclusions from Wilderness designation and split the area into four distinct sections. Unlike most of Colorado's mountains, the high and magnificently rugged Sangres were uplifted suddenly in massive blocks, creating a range of dramatic vertical proportions. Four fourteeners are clumped together in the midsection of the Wilderness, including Crestone Needle (14,197 feet). Many climbers, consider the Needle to be Colorado's most challenging 14,000-foot peak. Three more fourteeners stand together just south of the boundary. Melting snow feeds many creeks and small lakes, and nourishes a forest of oak, aspen, and spruce. Black bears and a few mountain lions live here, along with elk, deer, and bighorn sheep. Long (about 70 miles) and narrow describes the area, the state's third largest, and the going is rough for the hiker. Most of the 180 miles of trails end at alpine lakes set against virtually unclimbable walls. Great Sand Dunes National Preserve in now part of the Sangre de Cristo Wilderness. Planning to Visit the Sangre de Cristo Wilderness? How to follow the seven standard Leave No Trace principles differs in different parts of the country (desert vs. Rocky Mountains). Click on any of the principles listed below to learn more about how they apply in the Sangre de Cristo Wilderness.